The CBI in its final chargesheet in the Madan Tamang murder case has named Gorkha Janmukti Morcha chief Bimal Gurung and almost the entire top rung of the hill party, charging the leaders with murder, criminal conspiracy and rioting. 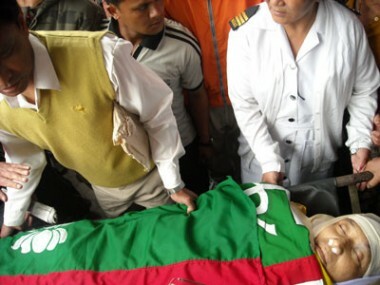 Madan Tamang, the chief of the Akhil Bharatiya Gorkha League leader, was hacked to death in the heart of Darjeeling town on May 21, 2010, while overseeing preparations for a political meeting. At the time he was assassinated, his party ABGL was the most vocal critic of the Morcha. The hacking was the most high-profile political murder in the Darjeeling hills in recent years. The FIR in the murder case had named 15 people, among them Gurung, his wife Asha who is the Nari Morcha chief, and several senior leaders. The central agency's chargesheet submitted to a CBI court in Calcutta today also named Gurung's wife Asha, who is the Nari Morcha chief, party assistant secretary Binay Tamang, MLA Harka Bahadur Chhetri, party general secretary Roshan Giri, GTA chairman Pradeep Pradhan, party vice-president Ramesh Allay and senior leader Devendra Sharma, among others. Besides murder, criminal conspiracy and rioting, they have been charged with rioting with deadly weapons, mischief causing damage and criminal intimidation. The final chargesheet comes four years after the central investigating agency took over the probe at the direction of Calcutta High Court. The CID had first taken up the case and submitted a chargesheet, naming 30 people and 61 witnesses. None of the top-rung Morcha leaders figured among the accused. After the CBI took over the case in 2011, it had named Dipen Mallay, an elected GTA Sabha member, in a supplementary chargesheet, taking the total number of accused to 31. "The accused named in the final chargesheet today have been charged with murder and criminal conspiracy," said a CBI officer. "There is specific evidence against each of those named and we will furnish them during trial," the officer added. After the case was give to the CID, one of the key accused, Nickol Tamang, escaped after being arrested by the state agency on August 16, 2010. He remains untraceable. On January 20, 2011, Calcutta High Court told the CBI to take over the murder case and the one regarding Nickol's disappearance. The late ABGL chief's widow, Bharati Tamang, who leads the party now, had also pleaded before the high court that the case be shifted out of Darjeeling, saying a fair trial was not possible there. Morcha general secretary Giri, when asked about today's chargesheet, said: "We will first consult our lawyers before making any statement." The ABGL leadership demanded the immediate arrest of the Morcha leaders. "The chargesheet has shown that none is above the law and it shows that the Morcha leadership is involved. We are told that these leaders have been shown as absconders in the chargesheet. We demand their immediate arrest," said Pratap Khati, the general secretary of the ABGL. He added: "Since these leaders are influential, we demand that trial should be held in custody." Of the 31 named in the chargesheets of the CBI and the CID, Dinesh Subba is untraceable. Another accused, Dil Kumar Rai, was found murdered near Darjeeling on December 28, 2011. Sangay Yolmo, another accused, is bed-ridden. Yolmo was hit by a bullet during a clash on the day Madan Tamang was assassinated. The bullet pierced his spine, making him paralytic. The rest are out on bail. CBI in its final chargesheet in the Madan Tamang murder case has named Gorkha Janmukti Morcha chief Bimal Gurung and almost the entire top rung of the hill party, charging the leaders with murder, criminal conspiracy and rioting.